The journey to Gatwick by taxi was eventful as the first snow in four years began to fall, but my taxi made it. I heard later the M25 closed completely on the approaches to Heathrow with numerous flights cancelled, but the M23 managed to remain open somehow. At the WOW Air desk, I checked my bag, for which I had paid an additional £31 roundtrip on top of the £150 roundtrip fare including taxes for the three hours each way to Reykjavik, a truly low-cost tariff. The desks were devoid of queues so I assumed passengers were delayed by the weather and I was through security in a flash. WOW is expanding fast by linking Europe with the US and Canada over Keflavik, now with a total of more than 30 destinations on the network. These are flown by new Airbus 320/1s and 330s with cute registrations like TF-MOM and TF-KID and liveried in a pink/purple hue with a massive WOW painted down the fuselage. Chief executive Skuli Mogensen and his 700 WOWers as he calls them, are busy expanding the airline’s horizons at a rapid canter, just like their cousins at Norwegian, same gene pool, same attitude to business growth, it seems. Boarding for flight WW815 was at gate 13 and started on time in a very orderly manner. I had checked-in online, so knew that I’d be seated toward the front of the cabin in row 9. The pitch on the leather-clad space-saver style seats, thankfully coloured dark blue and not purple, is adequate but as with most low-cost carriers these days, you just have to hope the person in front of you doesn’t think to recline. Pushback was scheduled for 20:10, but half an hour later there was no news and no announcements from cabin crew or flight deck. After another 15min, I asked a passing crew member what was happening. She said she didn’t know, so I suggested it would be a good idea to check with the captain. As an airline man of old, I assumed we were waiting for de-icing equipment and within 10min the crew announced this was indeed the case. It seemed odd the flight deck had not said a word throughout the delay, which finally stretched to about 90min. The first we heard from the captain was a request for cabin crew to take their seats. In my experience, there is nothing worse than being kept in the dark about a creeping delay and to be constructive I’d suggest both crew and pilots are given a little more training in communication – a few words go a long way in such a situation. We climbed rapidly from the runway and it was clear the pilots were keen to make up time for the lengthy delay, which indeed they did and we arrived in Keflavik 1hr late rather than the 90min we’d lost at Gatwick. Onboard service was slick and fast with snacks and drinks soon dispensed, but it was at this stage I realised Iceland was going to be an expensive place to visit. A can of Gull lager, the local Icelandic brew, was the equivalent of about £9 on board and a bar of local milk chocolate about £5. Arrival at the gate following landing in Keflavik was rapid but the walk from gate to passport control and arrivals was very lengthy, though it helped to get the senses working well after the 3hr flight, given the time was now about 01:15. The airport seemed reasonably new with a modern utilitarian feel and the main terminal was well organised and signed. By the time I was in the baggage hall, the cases were on the carousel. Clearly the airport is efficient and coping well with the rapid growth of WOW Air and there were plenty of staff around to direct passengers, particularly given the arrival time. The airport shuttle bus operated by Grayline costs about £25 and takes about 1hr to downtown Reykjavik. It’s cheaper than a taxi, which costs about four times as much, but if there are three people travelling together, it’s a relatively economic and convenient option, as you will be dropped at your hotel rather than going via a bus terminus where you transfer to a minibus for drop-off near to or at your chosen property. I noticed several travellers were staying at Airbnb locations, so a cab might be a better choice to avoid a walk in the biting cold. I reached my hotel, the Radisson Blu 1919, by about 03:00. As the name implies, it’s a fairly old building which has been tastefully modernised and we collapsed into bed after setting the alarm for 10:00. 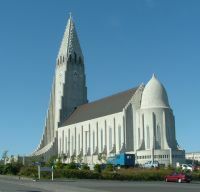 Given that it doesn’t get light until 11:00, it was ideal and we made our way towards the ‘must-see’ Cathedral at the top end of the main drag named Laugavegur, where many of the coffee shops, bars and restaurants are located. Suitably refreshed in a traditional coffee house called Mocha, we made our way to the cathedral, where a dramatic statue donated by the American people, commemorates the journey Leif Erikson made to Newfoundland, a full 500 years ahead of Columbus’s landfall much further south. I’d been told the cathedral is spectacular and it is, inside and out, but the queues for the lift to the top of the tower were snaking round the corner so I took it as read that the views of the city from up there were marvellous and decided to head to the port, where I’d heard several excellent fish restaurants were located. As you might expect, fish and seafood are a special treat in Iceland and the arctic cod, haddock and langoustines are the freshest you’ll ever taste. We tried several of the restaurants in this area and all were highly memorable but remember to budget for expensive drinks – even a bottle of house wine is going to set you back £40. 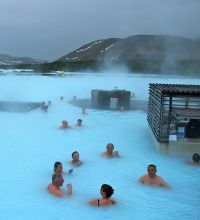 The most famous attraction in the Reykjavik area is the Blue Lagoon, a must-see experience, but remember to pre-book your visit well in advance of your journey as daytime slots fill rapidly. The lagoon is about 40min outside the city and the coach transfer includes a basic entry ticket which you can upgrade on arrival to a comfort package including robe, towel and sandals. It also includes a drink and a face mask treatment, which once you are in the wonderful pool area are essential extras. Suffice it to say the Blue Lagoon experience will live with you for the rest of your life. Don’t leave Iceland without a visit. 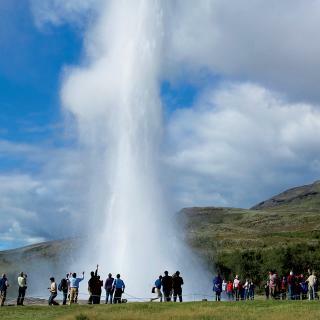 The other must-see experiences can be enjoyed as part of the Golden Triangle tour, a full day exploration of dramatic waterfalls, desolate wildernesses used by the Apollo astronauts for their moon-landing training, and the famous geysers. Again not something to be missed, the main geyser is no longer active but its smaller brother shoots steam high into the sky every 5-6min, as if nature has been tamed for tourism. 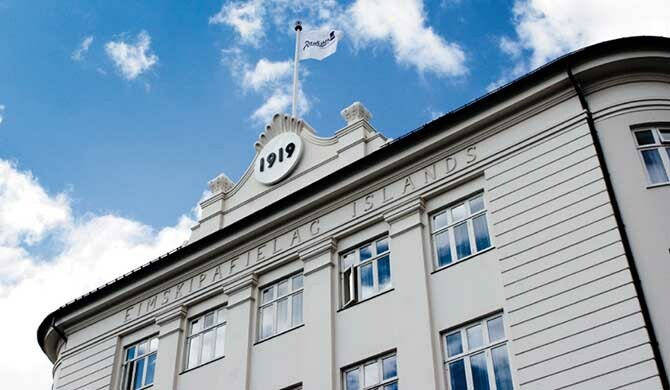 Iceland provides a stark contrast between nature at its most raw and explosive and relatively sophisticated social and lifestyle experiences in Reykjavik, particularly at night when the city seems to come alive in a blur of exuberant revelry. Given the limited number of hours of light during the winter, it’s no surprise the locals make the most of the daytime but throw themselves into the social scene in the evening with enthusiasm. The journey home seemed something of a comedown after such a tremendous few days of exploration and marvel and WOW Air delivered a good experience with one notable exception which had manifested itself on the way out – a lack of communication, this time at the departure gate, which left passengers frustrated and confused. Again, a delay was at the root of the problem but staff just wouldn’t or couldn’t say what the problem was. Passengers were eventually allowed on the bus to be taken to the aircraft side just a few hundred metres away, and then there was a wait while steps were found to be positioned to the front of the aircraft. Once on board, the volume of cabin baggage caused the crew to have to spend a great deal of time repositioning bags and coats to get everything stowed but it seems a majority of non-transferring passengers travel with hand baggage only to avoid the additional costs of checked baggage. Sadly this policy seems to add to frustration among both crew and passengers so perhaps needs reviewing. We were eventually told by the captain as we taxied out for take-off that the delay was due to a late incoming aircraft; not a surprise, but it would have been so much better if the gate staff had made an announcement to this effect. Again, a few words would have defused a frustrating experience. 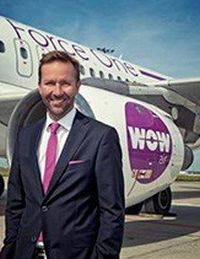 WOW Air is no doubt experiencing growing pains as it rapidly adds connecting services over its hub in Reykjavik. For summer 2017 passengers will connect at Keflavik to eight North American cities with very cheap fares. With more of an emphasis on timely communication of any disruption and a more obvious focus on punctuality, this relatively new and dynamic airline will prosper with its emphasis on highly competitive offerings and friendly service. Iceland will certainly benefit from the innovative approach of the enthusiastic WOWers working hard to keep up with the growth of a new hub. In December I had to go to LAX last minute for 4 days. I looked at the price on WOW and was wowed. I then checked comments about service reliability as it meant a connection in Keflavik. Those comments put me off as WOW are considered very unreliable with timings, even as your correspondent attests to above in the article. 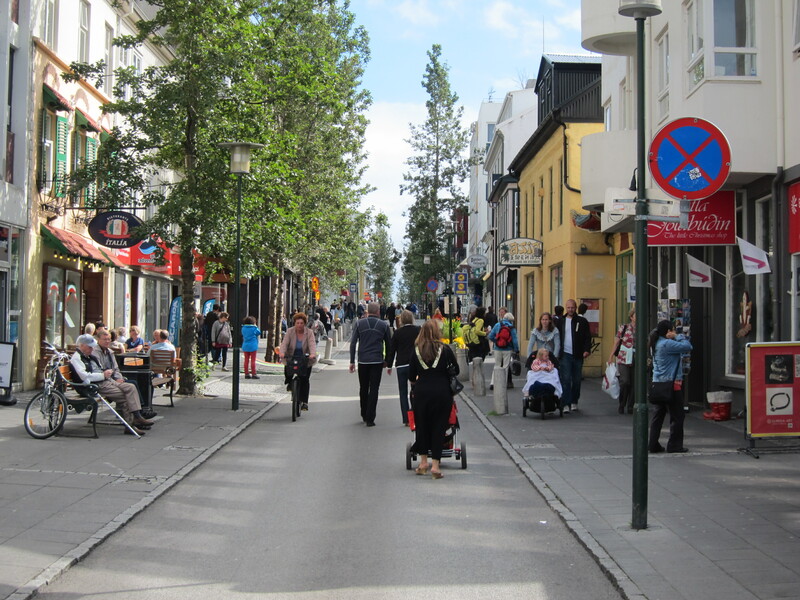 If you miss-connect you are liable for your own hotel in Iceland and for LAX that could have been two nights and again as said by your correspondent, the cost of anything in Reykjavik is \\\\\'through the roof\\\\\'. I travelled by Aer Lingus via Dublin and connected perfectly at a good rate, more than WOW but still good. A sandwich and a coffee along with US immigration and customs at Dublin Airport, allowing arrival in Lax like a domestic passenger, was a much cheaper, timesaving and reliable option in the long run. WOW have operational problems and I suggest a look at comments on-line re their service both flight and on board to become aware of these pitfalls. Perhaps a case of growing too fast before consolidating; remember Air Florida and Air Europe to name just two, there are others.